Ten human rights defenders from the grassroots level, two eminent social workers with international recognition, and a female football player were given honorary awards by Manusher Jonno Foundation (MJF) yesterday. The works of the activists focused on land rights, prevention of violence against women, child rights, and the rights of the indigenous people. The 10 grassroots activists were Jharna Ray, Madhobilata Chakma, and Nomita Chakma of Khagrachhari, Birendra Sangma of Mymensingh, Shafique Ullah of Noakhali, Kachhim Uddin of Tangail, Kananbala Gupta of Narail, Umme Kulsum Ranjana of Bogra, Kalpana Tirki of Rajshahi, and Rahela of Dinajpur. Two social workers Jharna Dhara Chowdhury, chief of Noakhali’s Gandhi Ashram, and Angela Gomes, executive director of Bachte Shekha, were also honoured along with Bipasha Mali, a young footballer who was recently called to play on the national women’s football team. 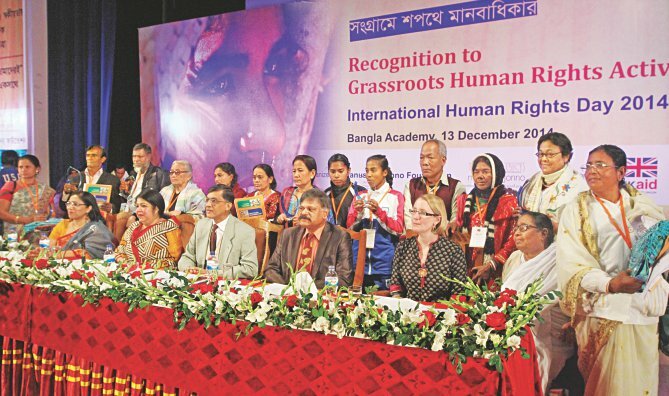 MJF honours 10 grassroots human rights defenders | Two social workers, a young female footballer also receive the honorary awards. via Cambodia: Side Event: “Human Rights Defenders in Cambodia: A Call For Support” / September 22, 2014 / Events / Human rights defenders / OMCT. Under the title “From threats to opportunities: Business and Human Rights Defenders” the International Service for Human Rights [ISHR] organises a side event on Friday 13 June 2014, 12h15 – 13h45 in Room IX of Palais des Nations, Geneva. Note that it will be the first public appearance of the new Rapporteur on Human Rights Defenders, Michael Forst. (https://thoolen.wordpress.com/2014/05/08/finally-it-is-final-michel-forst-the-new-rapporteur-on-human-rights-defenders/). For those unable to attend, a live webcast will be available at www.ishr.ch/webcast. You may also follow the event on Twitter @ISHRGlobal, using the hashtag #HRDs. Interesting to note that this piece found its way into the Tourism Section of the Thai newspaper Phuket Wan [“This is the first site on the island dedicated especially to tourism, property, restaurants and nightlife, and jobs”] of 19 May 2014. “The European Union EU must make the strengthening of bilateral relations with Laos contingent upon the Lao governments ability to make tangible progress in addressing key human rights issues, FIDH and it member organisation, the Lao Movement for Human Rights, said .” The paper then summarizes the briefing paper titled ‘Laos: The government’s failure to reform and address serious human rights issues call for EU action‘, released ahead of the 5th Laos-EU Working Group on Human Rights and Governance, held in Brussels today. [Foremost issues: rampant land grabbing and restrictions on freedom of expression, assembly, association, and religion as well as a credible investigation re human rights defender Sombath Somphone.